And to some extent, that’s absolutely true. But I think that we need to put a caveat on this saying. Yes, it is better to give than to receive, but you cannot give unless you have received. You cannot give unless you’ve been given to. The reality is, receiving help and gifts and wisdom is not something that a lot of us are very good at. 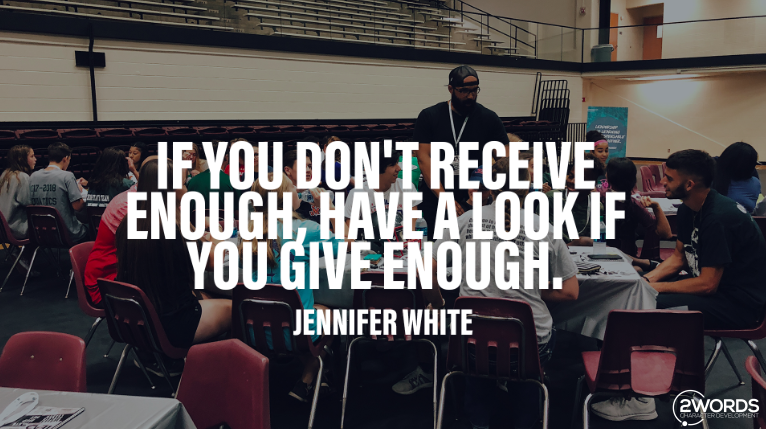 What happens is that a lot of people give and give and give and then up completely burned out because they’re giving everything they have and not being filled up at all. Yes, it is good to give, but we can’t give if we don’t receive. If you’re at a place where you need to receive, don't’ be afraid of it. Much like a cup that is full, receiving doesn’t hinder your giving, it enables it. What areas of your life are empty and in need of filling up? Think of 5 things that you have received lately. Write them down and be thankful for them. Who in your life models a healthy balance of giving and receiving? What do you need to do to start enabling yourself to receive from others?